Adding the coconut water replenishes lost electrolytes from all the perspiring in this heat and magic gelatin helps with the digestion of your dinner as well as being a fantastic way to take the supplement for your hair, skin, joints etc . In a small saucepan add the frozen fruit and honey, bring to a simmer and bubble for about 20 mins so it cooks into a nice thick texture. Stir occasionally and squash the whole cherries to break them up a bit. Mix through the potato starch, then add the OJ. Stir most of the time to disperse the starch and thicken the batch, bring to a slight simmer then switch off the heat. 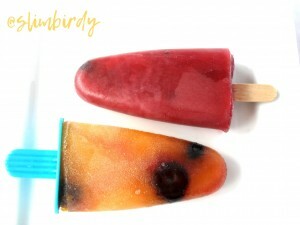 Allow to cool a little before pouring into popsicle moulds. I use the potato starch as a little thickener, which makes the end result a little more porous and bite-able, rather than freezing into a solid block. It’s so fresh and yum. In the picture I did ones with straight OJ and just threw in a few blueberries to see what it would taste like and it’s ok, but not as nice as making them into a jam first. I wonder what other flavours I can make?